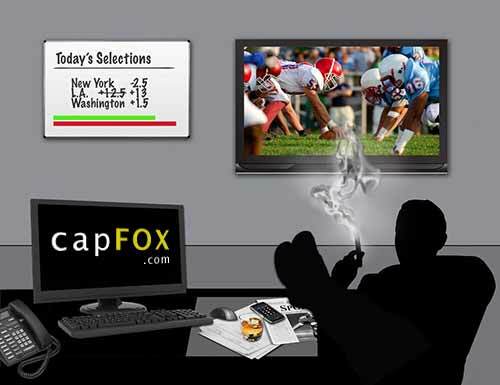 Entering 2016 CapFox.com is approaching 8,000 sports betting predictions and I have been very fortunate to have won 58% of my selections. Our overall record is a remarkable accomplishment considering the volatility with investing in sports picks. Sports betting is like any other alternative investment which can be speculative and there is no guaranteed rate of return. This isn’t like a broad based S&P 500 index fund which assumes you’ll receive 8% over the long term. That may be considered a safe investment which is not always the case with sports betting, however, the returns can be significantly higher with a long term approach and a smart investment strategy. If you can get past the fact that there are no locks or a guaranteed ROI then sports pick investing may be a nice supplementary addition to your portfolio. My background as a financial consultant and analyst helps me draw many comparisons to stock pickers and sports handicappers. My job as a sports handicapper is to compile years of research, analytics, trends, player data etc. and make it accessible for each matchup I choose to analyze. The same in depth analysis is conducted with a company valuation. The reason why I chose investing in sports over stocks is not only do I have better control of my investment but I provide an edge that you won’t get from your financial advisor. It would be safe to estimate that roughly 95% of sports bettors lose money each and every season or year. This number may be higher and most sports bettors won’t make it past their first season. The fact is that your typical sports bettor, if lucky, will hit 48-50% of their picks. The allure of sports betting is the illusion that you can break even by just hitting 52.4% of your picks but in reality this number is a tough achievement in itself. You need an smart edge and a well structured money management strategy in order to earn profits. Money Management is as critical to a sports investor as picking winners. I have devoted many hours of careful analysis and math to optimal money management systems. Money management is understanding how to adjust your bet sizing based on your goals (expected return vs. probability of positive returns), your investment length (one season or many), your growth preference (flat or compounding), your risk tolerance (high or low) and the proportion of your overall bankroll that you want to dedicate to sports betting. These are not questions I can answer for you as they pertain to your goals and financial bankroll and your long term expectations. As a general rule of thumb, wagering 1-2% of your bankroll per selection is good starting point when beginning your venture. I would also say that it’s always better to set conservative expectations and avoid over betting or chasing your bets. If you start chasing your bets then it’s over. Money management is about a long term outlook and if you begin making irrational short term decisions to “up the stakes” then your plan will ultimately fail. You need take an honest approach to your financials and figure out a starting amount that you can afford to lose over the course of a season. When you understand that “X” amount of dollars is allocated to sports investing and there is no guaranteed return then you are able to make a clear headed assessment of your financials. A common misconception is that you need “X” amount of dollars to begin investing. It takes you six months to a year to save your bankroll and the bankroll is depleted within four months of football betting. You have to allocate an appropriate amount of funds that you can live without in the event of a worse case scenario. One of the critical advantages I have is my handicapping allows me to quantify my edge. That is to say, that over many years of input my system not only identifies advantageous lines but it can also give me a rough percentage estimate of how likely a given team is to cover a particular spread. I have the capabilities of using my system to predict outcomes and odds before they are released by Vegas. This provides a tremendous advantage and allows me to compare odds and spot the best value bets. This allows me to set my expectations high each season and continue to broaden my knowledge and understanding of what makes oddsmakers tick. In my position, it’s become a chess match with Vegas over the course of my professional career. They may get me today but my goal is to get them tomorrow and be in the black at the end of the year. You must set your expectations according to your experience. You can’t expect to invest like the professionals if you’re an amateur. Just as you shouldn’t expect to be able to beat the stock market like only a handful of people in the world are capable of setting such expectations. I have clients all over the world and with different financial backings and goals. My long term clients have the ability to follow every game while some of my new members may follow a few games per week. I would never advise you to purchase every single play every day if you can not afford to do so. It’s about setting realistic expectations and running your own race. Investing in sports picks can be a realistic source of income for those that choose this form of alternative investment. Sports betting is no different than stocks or real estate and the fluctuations are real and can happen at any point during a season. If you seek out smart advice, a well thought out money management strategy and have patience in the market then you will find the ROI is much greater than the majority of your portfolio.